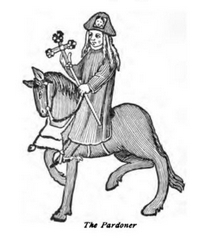 Chaucer.—Geoffrey Chaucer was a younger contemporary of the author or authors of Piers Ploughman, as he was born about 1340, and died about 1400. 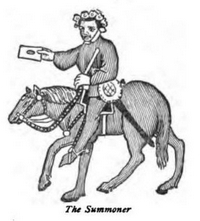 He was connected with the court, having married the sister-in-law of John of Gaunt the father of Henry IV. 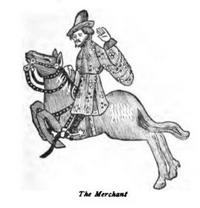 He was pensioned, employed in diplomacy, and made comptroller of the customs. As Langland’s poems were addressed to the middle and lower classes and written in their interest, so Chancer wrote for the nobles and gentry; and the tone of his poems was suited to the temper of his audience. 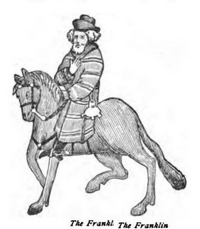 Chaucer was a voluminous writer, but his chief works are The Canterbury Tales, Troilus and Creside, and The Romaunt of the Rose. 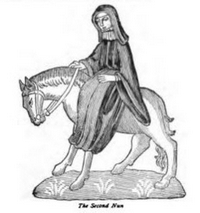 Of these the Canterbury Tales are the most original and the most characteristic of his genius, although Troilus and Creseide is as fine a narrative poem, not of the heroic cast, as exists in any literature. Chancer is essentially a narrative poet. He is the earliest poet since the revival of literature after the Dark Ages who has awakened an enduring sympathy in the characters and the feelings and the fate of his personages. He is the first indeed, who portrays real individuality of character. 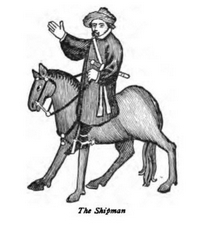 Each one of the personages in the pilgrimage to Canterbury. which is the occasion of the Tales, exists to this day in the minds of his readers as a living character that has as real and independent a being as any creature of flesh and blood that is met in one’s daily life. In this respect he is a rival of Scott (in his novels), and almost of Shakespeare. Like the former, he paints them; like the latter, he makes them unconsciously paint themselves. He is English in all the traits of his mind and his style; and in nothing more so than in his humor. So early (also in Piers Ploughman) did this peculiar trait of English literature, in which it is unrivalled by that of any other people, appear, and with all its inexpressible and humanizing charms in fullest bloom and subtlest fragrance. 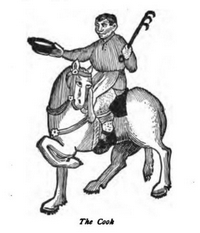 As an historical picture of the time in which they were written, the Canterbury Tales are as if the veil of five centuries were lifted and we looked in upon a gathering of our forefathers in the free enjoyment of each other’s society. 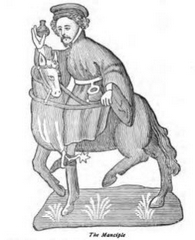 But above all Chaucer’s other charms that of his strong and clear imagination. What he described he saw in his mind’s eye as clearly as if it appeared before him in the body. We see with him the very personal traits and tricks of the people that he sets before us, less than the adventures through which they pass or which they relate. There is all the freshest charm of nature in him, joined with the elegance of an accomplished man of the world. So in his language there lingers some of the homely roughness of early English, while at the same time it is strongly marked with the dainty splendor of the speech that, like some other pretenders, came over with the Conqueror. 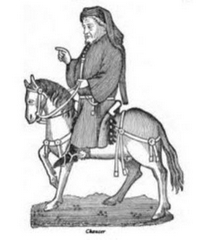 Chaucer stands alone, not only in his merits but in his literary position. He had no fellows; few contemporaries worth mentioning; and after his period a darkness fell upon English literature, through which glimmered a few dim and struggling lights whose only function was to make darkness visible. 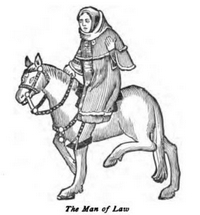 Gower.—John Gower, a barrister (b. about 1325; d. 1408), was the chief of Chaucer’s contemporaries. His reputation was great. 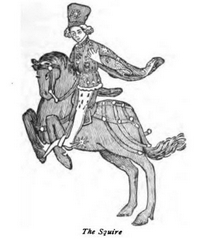 Chaucer himself speaks of him with deference, and calls him the “ moral Gower.” But the dull, dead weight of his style has sunk him out of sight, and left only his name floating upon oblivion. His Confessio Amantis (Confession of the Lover) is a long nondescript poem, to read which requires the patient, self-sacrificing courage of a conscientious investigator of the history of our older literature. It has little claim to attention even as a contemporary record of manners and morals. Ah! fredome is a noble thing Fredome mayss man to haiff liking Fredome all solace to man giffis He levys at ess that frely levys. Gyff fredome failyhe: for fre liking Is yharnyt our all othir thyng. The anger na the wretchyt dome That is cowplyt to foule thyrldome. And suld think fredome mar to pryss Than all the gold in warld that is. 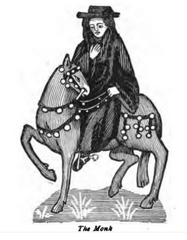 No less remarkable than the sudden uprising of such a poet as Chaucer, and one may even say of Barbour, is the fact that within their century there appeared no writers of either poetry or prose who were worthy of being called their followers, and that for nearly 200 years after the death of Chaucer the standard of literature was low. For this there were two reasons that can now be seen—perhaps others hidden by the distance of time. 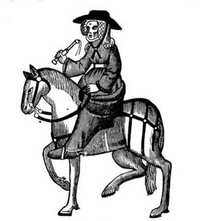 The first is the violent repression of all free thought which was brought about by the efforts of the Church to crush Lollardism and extinguish the very embers and sparks of the fire kindled by the Wycliffites; next the desolating civil War of the Roses, which broke out in 1455, and afflicted England with its consequences for quite half a century, although the war itself lasted but thirty years. Of the anti-Wycliffite writers the most eminent was Bishop Pecocke, who had some vivacity of style if no strength of thought. 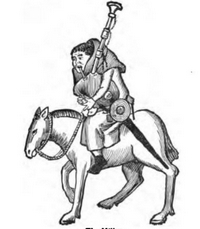 The most remarkable prose book of the latter part of the fifteenth century is the Morte d' Arthur of Sir Thomas Mallory (b. about 1430), compiled and translated from the French about 1470—a work which in its animation, and sometimes its simplicity and tenderness of style, does something to relieve the literary barrenness of its century. Mallory’s language is remarkable for its freedom from Romanic words, to which fact it owes much of its directness and its strength. Caxton.—At this period printing was introduced into England by William Caxton, who in 1474 printed his first book, a History of Troy, translated from the French. 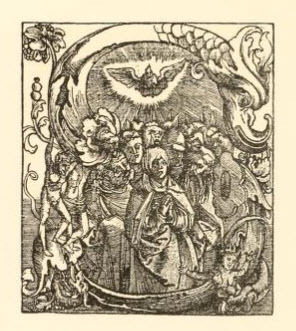 Caxton was a translator and an adapter as well as a printer, but not even his wonderful mechanical art had at first much influence upon either literature or language. 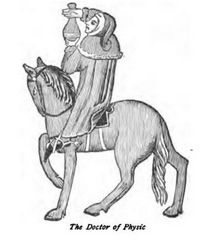 Of poets, or writers of rhyming verse, in this period we have Occleve (about 1370-1454) and Lydgate (about 1370-1450), whose names only need be mentioned in a sketch like this. 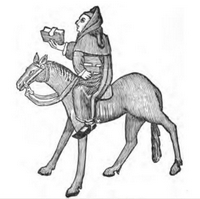 It was in the North that the best literary work was done at this period, although Andrew of Wyntoun, a clerical chronicler in verse who flourished about the beginning of the fifteenth century, is little more than a rude rhymester, the value of whose work is chiefly historical. 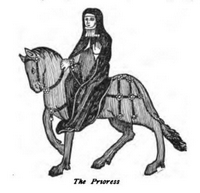 But James I. of Scotland, in his King's Quair, shows fancy, fine conceit, and the fruit of a careful study of Chaucer, whose works soon began to exercise a great influence upon poetical literature. 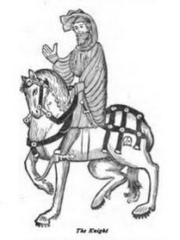 Robert Henryson (or Henderson) not only studied and imitated him, but also wrote a continuation of Troilus and Cresseide, which he called The Testament of Fair Creseide, which has been with some reason deemed not unworthy of being printed in company with Chaucer’s poem. Of all the extreme Northern English poets, Henryson and James I. show most the influence of the Southern language and literature. 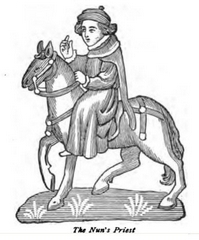 Henryson, who lived until about 1500, is the author of other poems of merit, among them the beautiful pastoral Robin and Makeyne, which was reprinted in the Percy Collection. A poet known as Henry the Minstrel, or Blind Harry, composed a long poem of which the life of William Wallace was the theme. It is a genuine strong piece of poetical “ making,” quite Homeric in a rude and humble way, and full of hatred of “ the Saxon ”; Blind Harry himself being probably as good a Saxon or “Anglo-Saxon” as there was to be found south of the Tweed. After this period the so-called Scots literature shows a wider divergence in spirit and in form from that of the South, or of England proper.